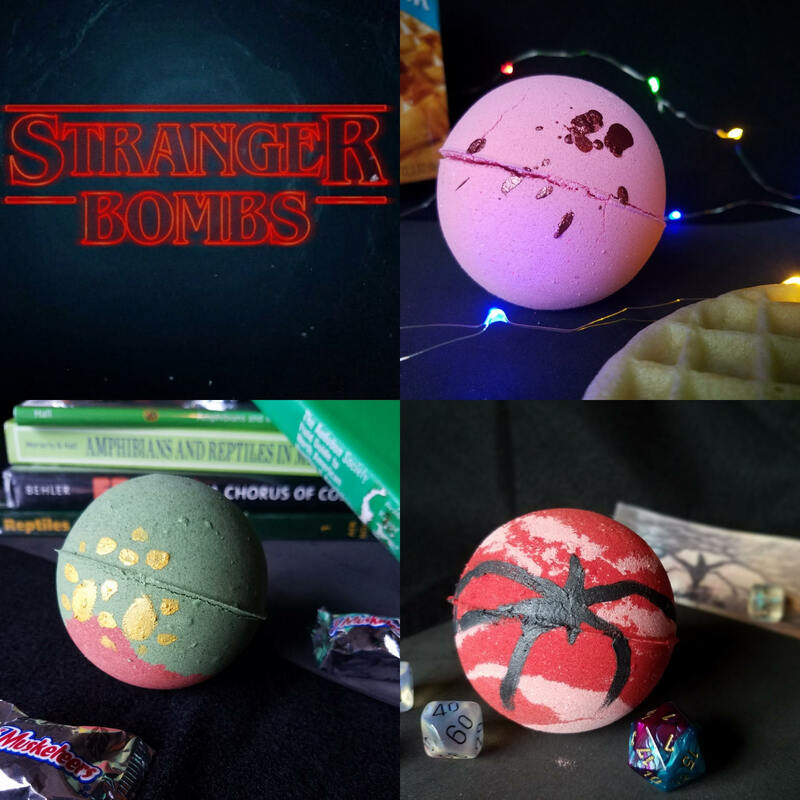 A set of three of Stranger Bombs inspired by the series Stranger Things. 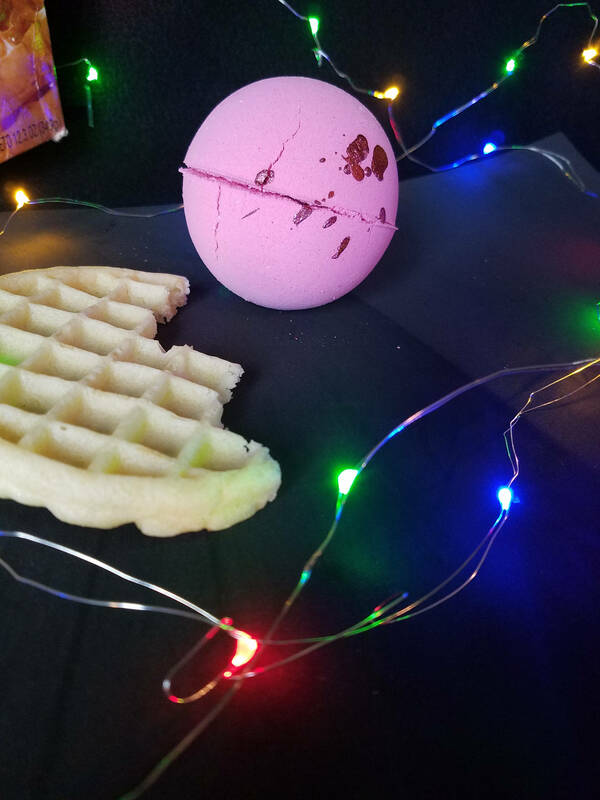 011: This pink bath bomb is inspired by Eleven from Stranger Things 1 & 2. It is inspired by the pink dress she wears in the first season and has drips of red mica blood from her nosebleeds. It is scented to smell like waffles and syrup. Once it dissolves it will leave your tub a pale, milky pink filled with swirls of foam. 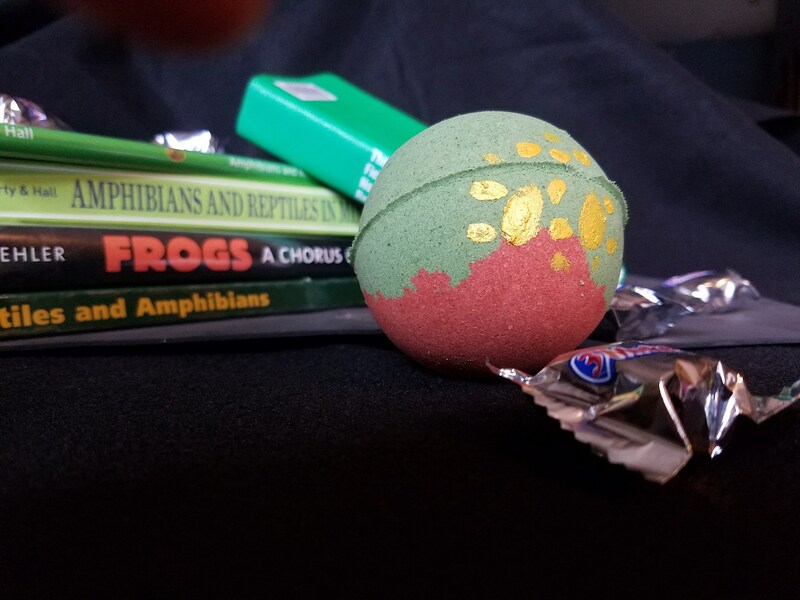 Dart the Pollywog: This green and rust red bath bomb is inspired by D'Artagnan, or Dart, from Stranger Things 2. The colors mimic the look of Dart with spots of painted yellow mica completing the look. Dustin and Dart share a love of 3 Musketeers bars (they're all nougat!) 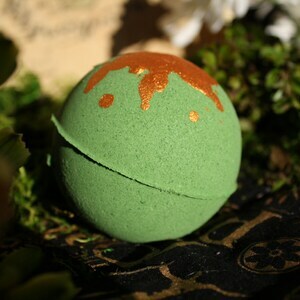 and is the inspiration for the scent of this bath bomb. Your tub will turn a dark mossy green after it is all dissolved. 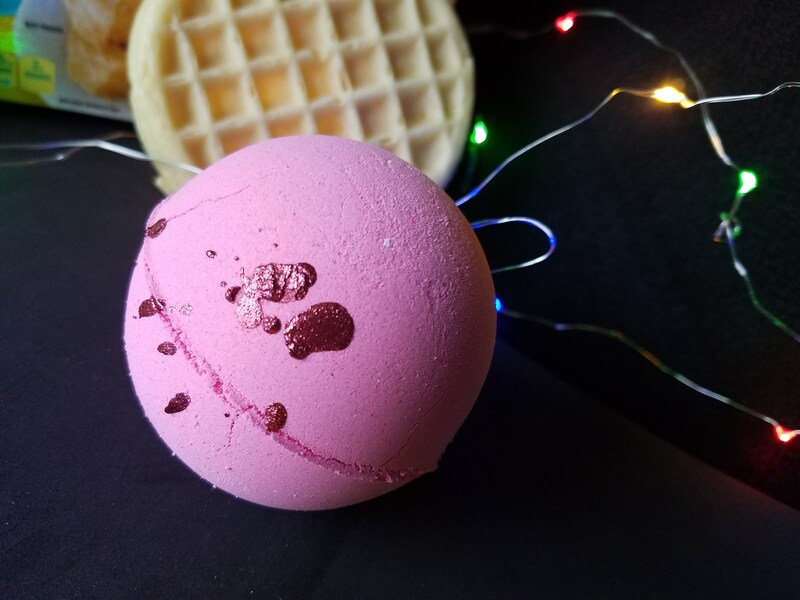 He Likes It Cold: This red and pink bath bomb is inspired by the Mind Flayer/Shadow Monster from Stranger Things 2. The inspiration was taken from the first scenes in which Will views the monster rising up against a stormy red sky in the Upside Down. 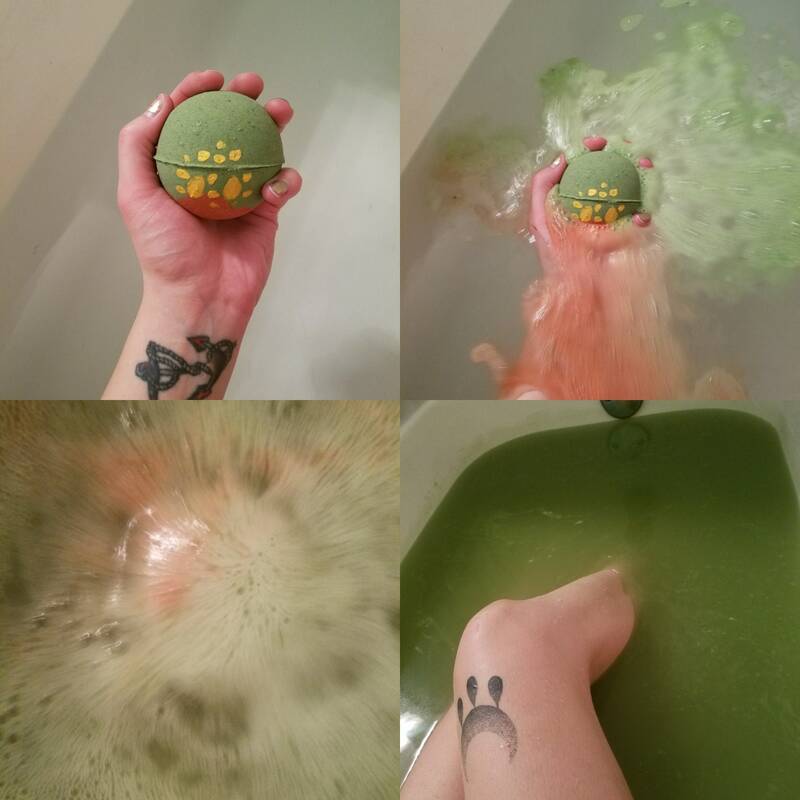 As this bath bomb dissolves it will create foamy tendrils that mimic the Shadow Monster. 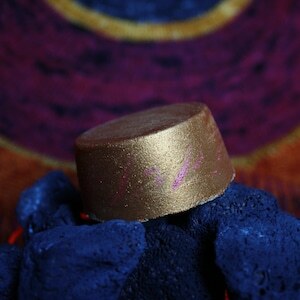 The scent is a blend of peppermint and black pepper essential oils, because He Likes It Cold. 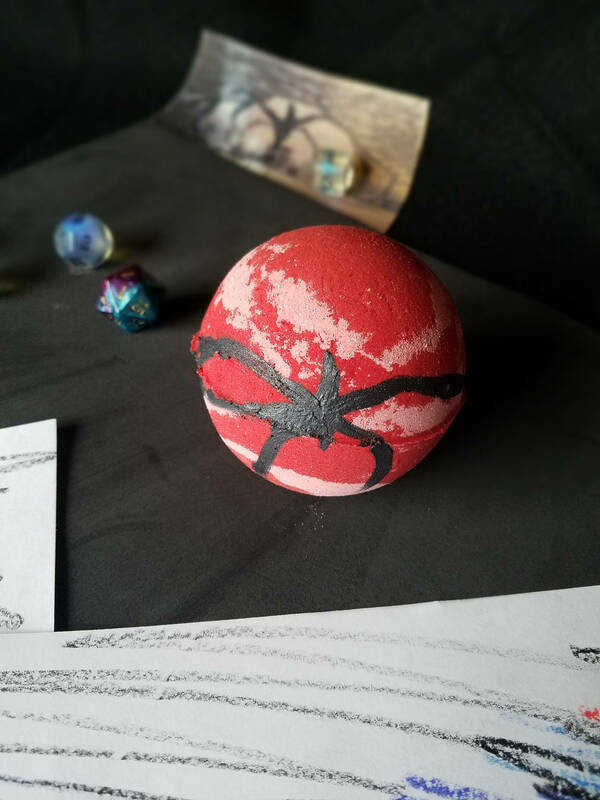 It has a hand drawn silhouette of the Mind Flayer in black mica. Once this bath bomb is fully dissolved it will leave your tub a milky red-orange. 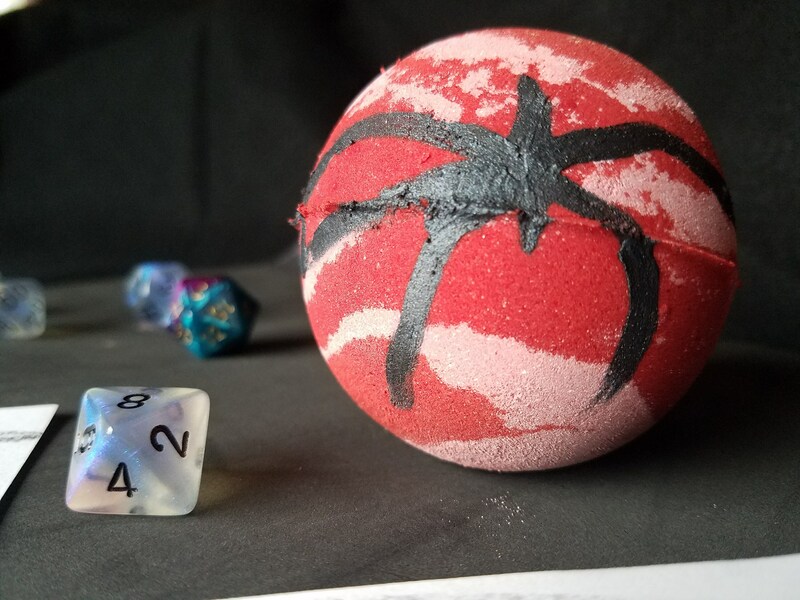 This listing is for three bath bombs that are approximately 2.75" in diameter. 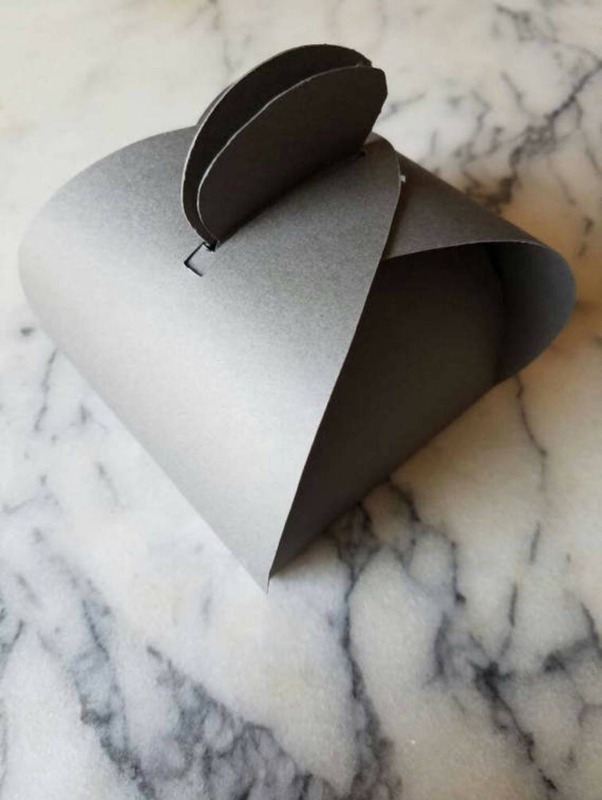 All items come individually packaged and can be packaged in a handmade grey box at an extra charge. They come labeled with ingredients, name of the bath bomb, and the scent. We gladly accept customized orders, just message us and we will be happy to work with you! 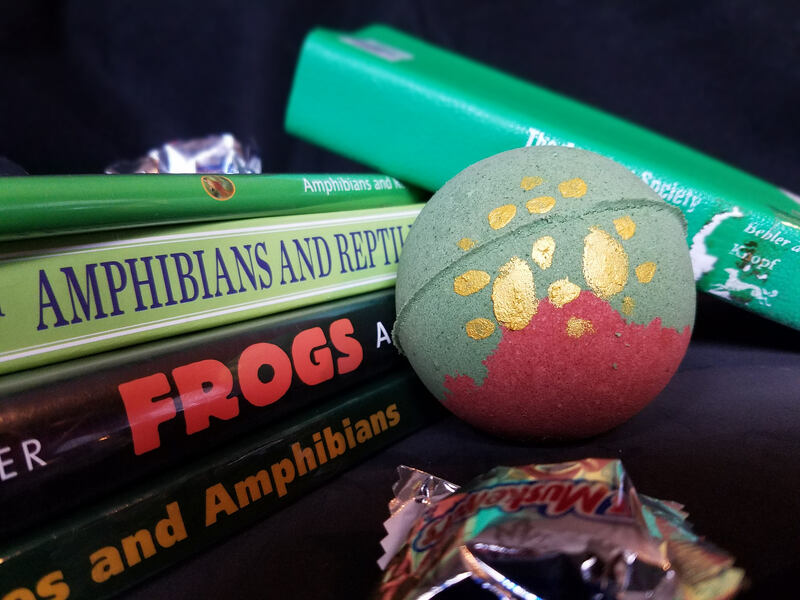 All of our bath bombs are 2.75" in diameter, unless otherwise noted in the product description. 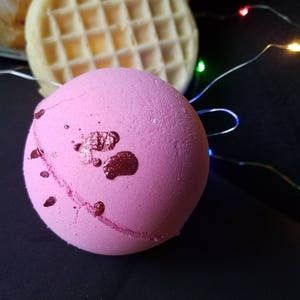 All of our bath bombs are made with: Baking soda, citric acid, cornstarch, coconut oil (unless other oil stated in description), fragrance oil/essential oil (some bombs have both or only one), colorant, and witch hazel. Some of our bath bombs contain sodium lauryl sulfoacetate (SLSA). If you want a bath bomb made without cornstarch, message us and we will be happy to use a substitute! 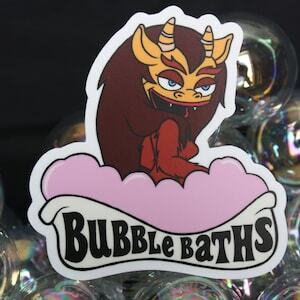 Bath bombs can make your tub slippery, please use caution entering and exiting after use. Rinse or wipe out your after using these! The colorants may stick to the sides of your tub, especially if there is left over soap scum. A quick rinse should get rid of any excess on a clean tub. Do not ingest this product or any water while in the tub. Not for children under 3. If you have sensitive skin some fragrances and colorants may cause irritation, use with caution. If interested in buying wholesale options, message us and we'll get back to you! Each bomb has different pricing and minimum purchasing requirements. Due to humidity and other circumstances beyond our control, our bath bombs might crack or break in half while in transit or upon opening. If this happens, please contact us and we will work with you to figure out a solution. We do not want to receive any product back, we cannot reuse it for a variety of reasons.